You know how sometimes you just click with a person? Sometimes this takes the form of instantly identifying a kindred spirit. Back in November 1990 I went on an end-of-university-exams holiday to Plettenberg Bay over New Year with my brother and some friends. This is the equivalent of the US institution of Spring Break – hundreds of students descended (as a friend puts it “like horny locusts”!) on this beautiful seaside resort and proceeded to drink double their own body weight in alcohol, dance all night in the only 2 nightclubs in town, lounge on the beach, play drinking games and generally behave as students do when they have no parental supervision and no exams to think about. I was a little older than my brother and his friends, being a bit of a latecomer to the idea of drunken debauchery, but I knew them all so it didn’t bother me that I was partnerless. Well, I say partnerless… but the truth, the whole truth and nothing but the truth was a little more complicated. Earlier that year I had been spectacularly dumped by my boyfriend (we’ll call him Laurel) and had gone to visit friends in Johannesburg to seek solace in the messy aftermath. There, as luck would have it, I met somebody (we’ll call him Hardy). We’ll gloss over the fact that I met Hardy over a quarters game and that my judgement was probably slightly less than accurate. And the fact that he was a pathological liar. Either way, I was smitten. Things progressed, Hardy came to visit me in my hometown, and he was hardly there a day when we went out and bumped slap bang into Laurel. I thought he’d be completely indifferent but nooooo. This sighting prompted soul searching on his part, followed by an abject apology for the dumping and declarations of undying love. Well, I did what any sensible girl would do: I kept my options open. So by the time November rolled round, I was seeing Laurel again, but still trading passionate letters and phonecalls with Hardy in Johannesburg. Not knowing, of course, that Hardy was shacked up with his ex-girlfriend at the time. Anyhoooo. So there we were in Plettenberg Bay one afternoon in 1990, carrying on a huge game of quarters with all the 15 or so occupants of the 6-bed house (don’t even ask – people were practically sleeping in the fridge), and people slowly began to drift away from the game. During the game, I’d been trading quips with Bron, a friend of my brother’s, and as people drifted away, we got chatting about relationships. And the more we chatted, the more we realised we had in common: a shared offbeat sense of humour, a love of Terry Pratchett, a love of poetry and, umm, the fact that we were both attempting to carry on relationships with 2 boys in different cities. It’s almost 20 years later, Laurel and Hardy are long gone, but Bron and I are still best of friends. Sometimes, you just know right from the start when you’ve found a soulmate. Cream the butter and sugar together in a bowl. Beat in the egg and vanilla extract. Mix the flour, baking soda and salt in another bowl; then mix the dry ingredients into the wet. 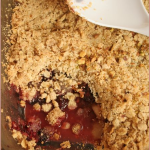 Mix in the rolled oats, cranberries, pistachios and chocolate chips. Place the dough onto a cookie sheet one table spoon at a time. Bake in a 350F preheated oven for 10-12 minutes. I’m a new reader of your blog, and didn’t see where this post was going, but great writing and beautiful pictures. I think many a romance was started an ended in Plett……..we are spending our holiday there again this year…. I could not agree with you more about finding a kindred spirit……my friend and I have been friends now for over 20 years and we still contact each other daily and I make time to see her at least once a week. The cookies well…….they have everything I like in a cookie, nuts, fruit, crunch and a chewy texture…yum! I enjot both your writing and cookinf style. the cmbo of pistachio, cranberry, and chcolate sounds so good.I need a cookie now with after dinner cup of tea. And I agree about Kevin’s food… But what really caught my eye is that you’re a Terry Pratchett fan!!!! My friend in Spain got me hooked a few years back… He is collecting, and I believe has, all first editions…. Lovely post, thanks, and the recipe is very similar but not identical to the cranberry white choc chip cookies in both Nigella Christmas and Bill Granger’s Holiday books, which I tried this past holiday (they use pecan nuts instead). Yes, they are divine and totally to be recommended. I made mine with choc chips, like you, and think they are better this way. White chocolate somehow is often just too sweet. LOL Jeanne. Loved the passionate story with the not so passionate Laurel & Hardy. Thank heavens for Bron!! Saw your coffee gravy at Kevin’s. Aaw, you are so sweet to make these cookies. They look stellar & I feel like sneaking a couple off your plate. I love cranberry & pistachios in cookies. Made a bar cookie a while ago in the same combo, & they were yum! Have a great day you good lady! You can’t do this to me, it’s day 4 of my diet and I’m hanging in by my finger-nails!!! Gawd those cookies look divine! Loved the peek into your student love-life – LOL. Anything with pistachios in it is fantastic in my book. They look great. Thanks for the kind words! I feel the same. I have a lot of your recipes bookmarked and on my to try list as well! 🙂 I bet the chocolate chips were just as good as the white. Great photos! I joined the cranberry craze rather late, but now I love them – I used them yesterday in my bread when I ran out of raisins! Pistachios. Mmmmm. Cranberries. Mmmmm. Cookies. Mmmmm. how do you make choc. chip cookies in GA, because i have tried several times and the batter is really watery and when i add more flour, they seem ok, until they come out of the oven…they are very pale and rock hard…i used to live in chicago and everyone always said how i made the best choc. chip cookies, but they don’t seem to be cooperating with me in Georgia…. what can i do?